The Wisconsin win for a determined but not be underestimated Bernie Sanders is his sixth in the last seven presidential nominating contests, but he still faces a difficult task to overtake Clinton as the presidential nominating race moves to New York on April 19 and to five other Eastern states on April 26 ~ but the momentum has clearly changed in favor of Bernie partcularly regarding the direction of the Democratic Party. WSWS reports that "Sanders outpolled Clinton in 79 of the state’s 82 counties and dominated nearly every demographic and income group. He won more than 80 percent of the vote among those aged 18 to 29, more than 70 percent of the vote among independents, and defeated Clinton by 54 percent to 44 percent among nonwhite voters under 45 years of age." He has now won seven of the last eight contests for the Democratic presidential nomination. Most of exit poll voters want change but correctly feel that Sanders is better equipped to “shake up” the status quo ~ and Hillary unfortunately represents the embodiment of the establishment and status quo. WSWS further reports that "In its election night coverage, the American media barely reported these figures, showing far greater interest in the fortunes of billionaire demagogue Donald Trump, the Republican frontrunner. The media portrayed the victory of Texas Senator Ted Cruz over Trump as a political earthquake while downplaying Sanders’ more sweeping victory over Clinton." 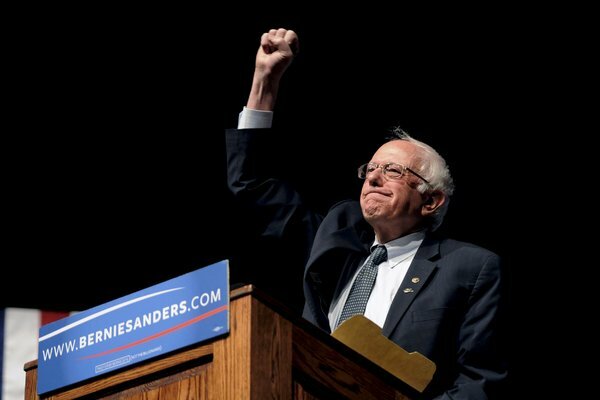 Despite this near media blackout ~ Sanders said he was optimistic he could win in New York, Oregon, and California and both Hillary and the establishment are clearly rattled. The victory comes as a reluctant Hillary and eager Bernie have agreed to meet for a debate on April 14, five days before the New York primary. As John Pilger expounds in CounterPunch ~ "The 2008 presidential campaign of Barack Obama should have alerted even the most dewy-eyed. Obama based his “hope” campaign almost entirely on the fact of an African-American aspiring to lead the land of slavery. He was also “antiwar”. As a new kind of marketing manager for the status quo, the unctuous Obama was an inspired choice. Even at the end of his blood-spattered presidency, with his signature drones spreading infinitely more terror and death around the world than that ignited by jihadists in Paris and Brussels, Obama is fawned on as “cool” (the Guardian)." But Pilger saves his most damaging words for Hillary ~ "Trump is a media hate figure. That alone should arouse our scepticism.…The danger to the rest of us is not Trump, but Hillary Clinton. She is no maverick. As presidential election day draws near, Clinton will be hailed as the first female president, regardless of her crimes and lies ~ just as Barack Obama was lauded as the first black president and liberals swallowed his nonsense about “hope". "One of Hillary Clinton’s most searing crimes was the destruction of Libya in 2011. At her urging, and with American logistical support, NATO, launched 9,700 “strike sorties” against Libya, according to its own records, of which more than a third were aimed at civilian targets. They included missiles with uranium warheads. See the photographs of the rubble of Misurata and Sirte, and the mass graves identified by the Red Cross. Read the UNICEF report on the children killed, “most (of them) under the age of ten”. As WSWS points out ~ "Sanders is riding a wave of economic anger and hostility over social inequality. Despite all efforts to cover it up, it has proven impossible to conceal the deeply rooted sickness of American society: the ever-widening economic gulf between the top one percent (or one-tenth of one percent) and the broad masses who work for a living and produce the wealth" ~ but I point out that Sanders is a truth teller and credible people's candidate whereas Hillary is not trusted and a pawn for an already discredited establishment, which is obviously her moneyed 1% base. As I have said before ~ the true test of a person's character is not how they handle adversity but how do they handle political power and in that regard Hillary's flawed political character is best witnessed with her unguarded reaction on CBS, as Secretary of State, to the brutal assassination of former ally Libya's Muammar Gadhafi ~ "We Came, We Saw and He Died "
Make no mistake about this ~ The Clintons ARE the Status Quo and the Establishment and Hillary's feeble attempts to don populist garb is laughable. If Hillary tries to disqualify Sanders, she will end up disqualifying herself in the minds of millions of voters who do not trust the Clinton lie machine. She will then parade a thoroughly discredited Bill Clinton, from out of political mothballs, as well as try to win at any cost ~ including her own extremely shaky integrity. I rest my case, the only true alternative to the establishment and a continuation of the Status Quo is Bernie Sanders.